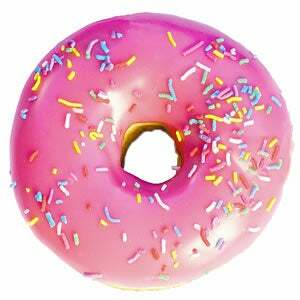 This is not a picture of the OFFENSIVE doughnut. This doughnut looks just like the ones on the Simpsons, so it is perfect. The doughnut hole in question is totally NSFW so the image of it is posted after the jump (GRAPHIC). I'm not even sure how to process this. I complained to my boss but she pretended like there was nothing offensive about the doughnut hole. I am floored that this sort of sexualized pastry is acceptable in my work place. I think the next step is to file a complaint with HR and maybe take a personal day to calm down. What do you think, Groupthink? Am I being too sensitive? Any legal advice?